Thank you for your interest in our program. We hope you will find the information on this site helpful in determining how well our program matches your interest. We are a new, developing program with an energetic and commited core faculty. University of Maryland Prince Georges Hospital Center is located in the Cheverly suburb of Washington, DC. It is a 300 bed, acute care, teaching hospital with a state-of-the-art Intensive Services Pavilion housing 10 operating suites, a 24-bed intensive care unit, two cardiac catheterization labs and a special procedures unit. The emergency department includes private acute-care treatment rooms, a six bed resuscitation area, an observation unit, two trauma rooms and a separate ambulatory/walk-in care area. All Labor and Delivery Rooms and Postpartum Units offer private accommodations. Currently the hospital administration is finalizing plans for the construction of a new Regional Hospital Center slated for completion in 2018. The Family Medicine Residency program is housed in our brand new Family Health and Wellness Center located adjacent to the hospital. This facility offers a full range of outpatient services to newborns, children, adolescents, adults and geriatrics. The Center offers 12 examination rooms, two procedure rooms, individual workstations for each Resident, spacious waiting room and support staff space, as well as state of the art telecommunication equipment in our conference rooms to allow didactic presentations with speakers outside the community. The Greater Washington, DC area offers a wonderfully diverse population and Residents have the opportunity to work with a rich group of patients and medical issues across a wide spectrum ranging from the underservedto the medically sophisticated. As to Resident life, Washington, DC offers it all. Whether it’s the Smithsonian Institution’s museums, the neighborhood coffee houses or the trails along the C&O Canal, there is plenty to fulfill your own pursuit of wellness. Sports teams, the Chesapeake Bay, art and every form of culture are right at hand. Please browse the pages of our site. We hope you like what you see. Welcome. I am Dr. Stacy Ross, the Program Director of the Family Medicine Residency Program. We are a relatively new program which I have deliberately kept small (4-4-4) to give our Residents a uniquely personal and supportive educational experience. As someone who has spent their professional life in this community – I maintained a full time Family Medicine private practice for years and was involved in a prior Family Medicine Residency program – I want to not only provide our Residents with the best medical education in Family Medicine possible, butprovide the benefit of that education to the improvement of the health of this community. I am particularly proud of our brand new Family Wellness Center. It is a full service Family Medicine clinic where our residents will learn as they treat patients from young to old and from simple to complex in their medical issues. Our residents gain experience in a variety of environments which include our inpatient Family Medicine service, a variety of private practitioners’ outpatient offices in different specialites, Emergency services unit, Surgery service as well as pediatrics and obstetrics. Our didactic sessions, held on a weekly basis, include a full spectrum of medical topics. Guest speakers provide a diversity of information and views of medical treatment and practice. These sessions also include Medical Students on their Family Medicine Rotations. We challenge our residents and students in these sessions and encourage dialogue and discussion. I have chosen to make our Behavioral Health and Community Health curriculum longitudinal so these topics are included in our didactic presentations. We also have a Wellness curriculum, designed to encourage and support our Residents as they deal with the stresses and challenges of their training program. Thank you for visiting our site. I hope you will see my vision for our Program reflected in the information here. Training competent, ethical, and knowledgeable professionals who serve our citizens well is my goal and my passion. Our residents have the opportunity to work in a diverse variety of settings in both inpatient and outpatient service. This new outpatient clinic which adjoins the Hospital provides the opportunity for Residents to provide care to a variety of patient groups and over the entire course of their training. We encourage the development of a strong Patient-Doctor bond and appreciate the benefit of maintaining that relationship over time. Patients present medical needs ranging from the simple to the very complex. Our population comes from a diverse community which provides the opportunity for training in many forms of doctor-patient communication, encourages respect and tolerance for differences and aids in developing cultural competence. The Attendings are Board Certified Family Medicine physicians who have experience in similar working environments within a clinic or private practice model. PGHC is a 300 bed, acute care, teaching hospital providing the typical range of hospital inpatient services. It includes a state of the art Intensive Services Unit, a Behavioral Health Unit and houses a satellite of the Mt. Washington Pediatric Hospital within its walls. The Family Medicine Residency maintains a Family Medicine Service in the hospital. First year residents are actively involved on this service, working with second and third year Residents. Residents also serve rotations in the Emergency Department, in Surgery, and in Obstetrics. Additional rotations which may involve inpatient care include cardiology, neurology, gastroenterology and dermatology. Serving the nation’s children for more than 140 years, Children’s is a proven leader in the development and application of innovative new treatments for childhood illness and injury. Children’s also offers the opportunity for experience in Neonatology, Trauma, Orthopaedic Surgery, Sports Medicine for Children, Neurology and Neurosurgery. Residents maintain patient care of Nursing Home residents throughout their three year training with expanded responsibilities and increased patient load over time. 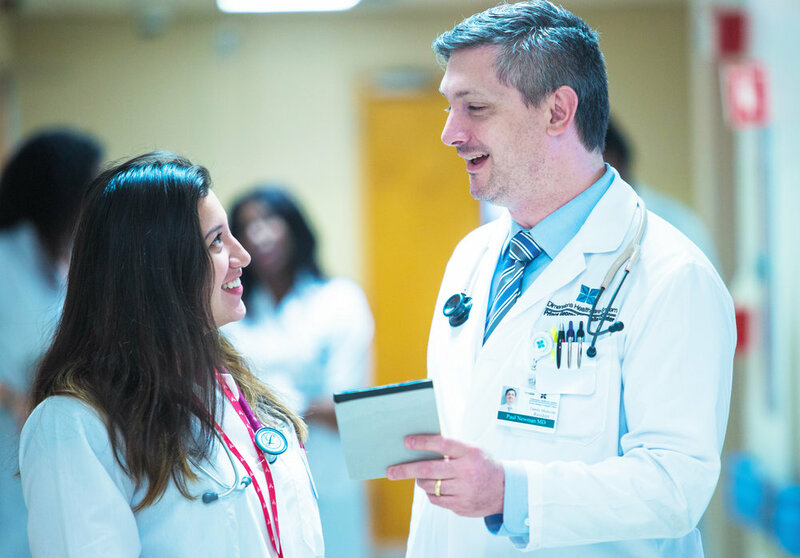 The Residency program maintains an expanding number of relationships with community providers in a variety of medical specialties, including outpatient pediatrics, dermatology, gastroenterology and sports medicine. Residents are encouraged to pursue areas of interest and the Program makes good efforts to find rotation placements if they are not currently available. These rotations provide exposure not only to the particular patient population of interest but expose the resident to a variety of Practice models. Dr. Adebowale Prest is a graduate of the University of Maryland, School of Medicine. 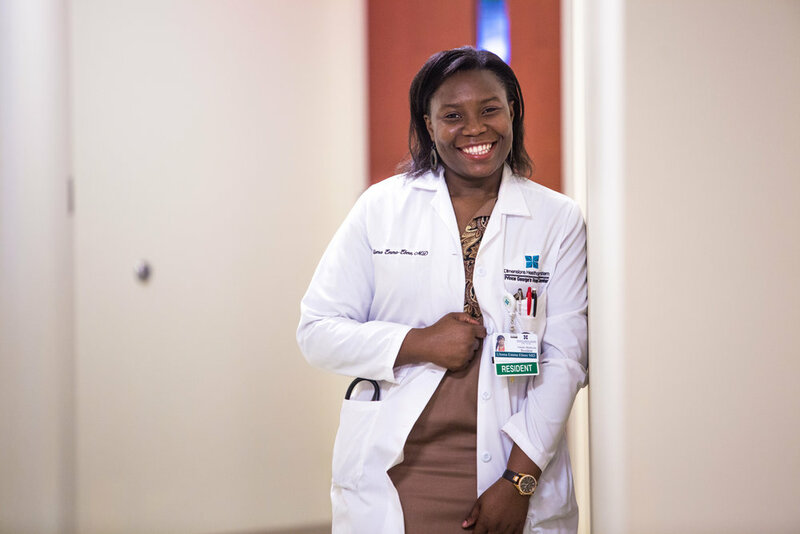 She completed her Family Medicine Residency at Eastern Virginia Medical School and completed a Fellowship in Obstetrics and Gynecology from Pinnacle Health in Harrisburg, PA. Her areas of interest include pediatrics, rural and underserved medical provider access and health service to the LGBTQIA community. Dr. Prest is an advocate for healthy alternative lifestyles. She is an active member of the American Academy of Family Physicians and serves on the Board of the Maryland Academy of Family Medicine. Behavioral Medicine is a longitudinal curriculum which is taught through didactic presentations and precepting by the Director of Behavioral Health concurrent with patient care in the Family Health and Wellness Center and rounds on the Family Medicine inpatient unit. Additional training is provided with a rotation on the Behavioral Health Inpatient Unit at University of Maryland Prince Georges Hospital Center. Practice Management is a hybrid longitudinal curriculum which includes didactic presentations in the first two years and a rotation in Practice Management during the third year. Community Health is a hybrid longitudinal curriculum which includes didactic presentations, guest speakers from community agencies and ‘field trips’ to visit community health agencies. Residents will have the opportunity to use elective time to pursue a particular community health interest. Residents are required to conduct Scholarly Activity during their training to include at least one Quality Improvement project and one Research project. The program encourages Residents to define areas of interest early in their training to provide adequate time to conduct their scholarly activity. Didactic presentations on defining research questions, types of research projects, ethical research and statistical analysis assist the Resident in moving forward with confidence in their activities. Projects may involve clinic patients, hospital patients and procedures, or, when possible, community education and health outcome. As a new Residency program we have the unique opportunity to include Residents in quality improvement through evaluation of program needs. A recent Quality Improvement project by a PGY2 resulted in the implementation of a Physician Wellness program within the Residency and a proposal to present the concept for Hospital-wide consideration.